The Nexus 5 and Moto X 2014 are two of the most popular handsets of the past year which is no surprise since both offer one of the best bang for buck ratio you can find. 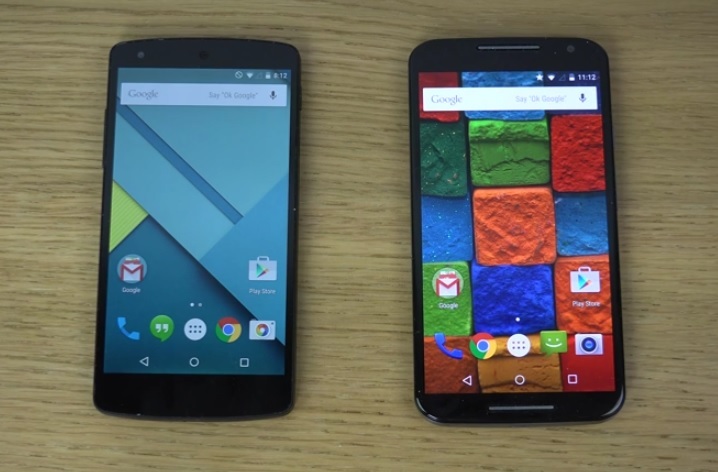 That means that both the Nexus 5 and Moto X 2015 harbor great specs for a more than decent price tag. The LG Nexus 5 is a bit older than the Moto X, but nonetheless it has held its place this year and can still be considered one of the best budget handsets on the market. The Moto X doesn’t fare less, since after its introduction at IFA Berlin, it has rapidly gathered a following of people who appreciate the many design variations the handset is available in, not to mention the great specs and cheap price tag. We compare the Nexus 5 to the Motorola Moto X 2015, because even though the former will no longer be produced, if one can get their hands on it, they will surely be happy, while the Moto X could be an excellent choice if you are on a budget but would like a pretty high-end phone nonetheless. The two flagships meet in the middle of current flagship trends and demonstrate that good quality doesn’t necessarily come with useless features (read: Galaxy S5) and an overpriced tag (read iPhone 6). 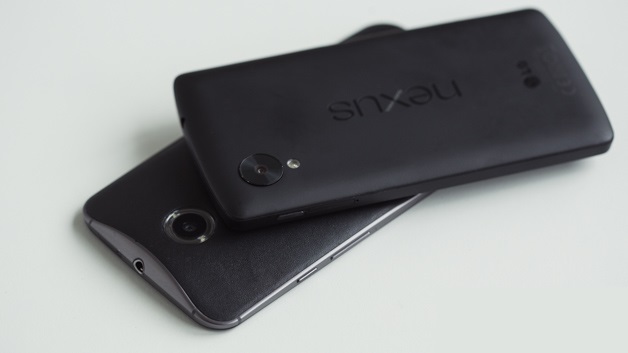 The Nexus 5 is among the simplest phones you will find, so if you are looking for something exquisite, you might be better off checking out the Sharp Aquos Crystal or indeed, the Moto X. The Moto X is more fun when it comes to design because through Moto Maker, you can choose out of a handful of different back panels and customizations so you can have exactly the phone you had been imagining in the past few months. 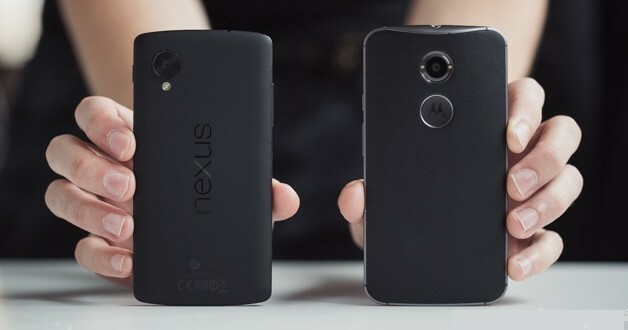 The Nexus 5 size is a bit smaller and thinner than the Moto X, measuring 137.9*69.2*8.6 vs 140.8*72*10, so if you’re into compact phones, out of these two Google’s and LG’s flagship would suit you best. When it comes to software, the Nexus 5 will definitely give you the stock Android experience you’ve been longing for, if that’s the case. At the same time, the Moto X will give you the nearest stock experience on the market without buying a Google Play Edition or Nexus device, since it comes with surprisingly minor tweaks and just a few bloat apps. 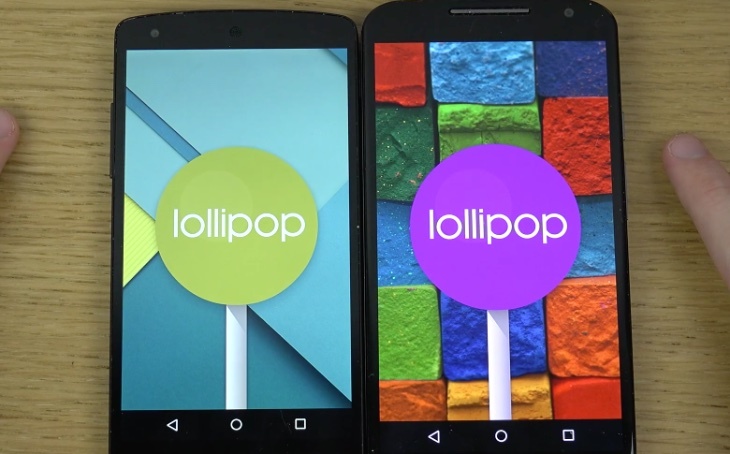 Android 5.0 Lollipop is the current version of Google’s OS available for both smartphones, so you’re going to get the latest and greatest no matter which you choose. Hardware and spec-wise the Nexus 5 is just a bit inferior to the Moto X, seeing as it has the slightly older Snapdragon 800 CPU running the show, while Motorola’s flagship has the Snapdragon 800 under the hood. That CPU is backed by 2 GB RAM and either 16 or 32 GB internal storage, as well as an Adreno 330 CPU on the Nexus 5, while the Moto X 2014 features the same GPU and the same RAM and ROM measurements. The Super AMOLED display on the Moto X does look a bit better, though. Display is one of the most important aspects on a smartphone and neither of our subjects disappoints in any way. The Nexus 5 features a 4.95 inch True HD IPS+ display with a 1080*1920 resolution amounting to 445 ppi pixel density, protected by Corning Gorilla Glass 3. The Moto X has a slightly larger, 5.2 inch Super AMOLED display with the same 1080*1920 resolution amounting to a lesser 424 ppi pixel density. Even though there is a slight difference in pixel density, you won’t notice any difference when using the two flagships independently. The Nexus 5 camera is an 8 MP shooter with optical image stabilization and an LED flash on the rear and a 1.3 MP sensor on the front. 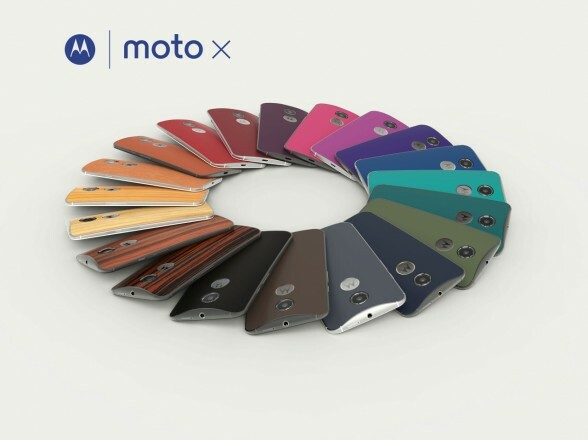 The Moto X has a 13 MP rear camera with dual-LED flash and a 2 MP front camera. Most of you familiar with the Nexus 5 will agree with me when I say that even though Google’s flagship has optical image stabilization, the camera isn’t very good. The Moto X is certainly better in this respect, so if you tend to take a lot of photos with your phone, Motorola’s recent flagship should be the best for you. NFC is present on both our subjects, which means that you can make use of NFC tags if you’re into that sort of thing, as well as use the chip inside the flagship for secure connections between Android phones. One of the features that we would have appreciated on both these flagships is the microSD card slot, but neither has it, so you will have to improvise with cloud storage in case your ROM won’t do the trick. The Nexus 5 features Qi wireless charging, which is a neat feature, while the Moto X 2014 counteracts with fast battery charging via Quick Charge 2.0. The batteries are identical 2300 mAH ones on both devices, and the battery life on both is mostly the same. 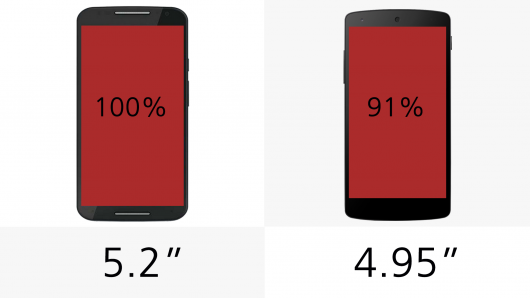 Even though the Nexus 5 tends to drain a bit more, it still doesn’t have a big impact on general usability. Battery life depends greatly on how you actually use your smartphone, so we can’t put a definite tag of good or bad on a phone because it would be entirely subjective. If I had to estimate, I would say the Nexus 5 battery would be good for about a day, while the Moto X battery will stay up late, even until morning. The Nexus 5 is definitely a great stock Android device, but it is only available in limited numbers since Google has discontinued its production. The Moto X 2014 on the other hand is almost entirely new and will be around for quite some time. When it comes to the most future-proof device, the Moto X would be your best choice, but that doesn’t mean Google will stop supporting the Nexus 5 with software upgrades in the future. If you are more of a compact smartphone type, Google’s flagship would be more appropriate for you, but if you would rather have a good camera that you can make use of, the Moto X is you best bet in this case. When it comes to price, the Nexus 5 can currently be found on e-commerce sites for as low as $380, which is a pretty nice price considering that mid-range models like the Galaxy A3 and A5 cost just as much if not more. The Moto X 2014 is just as cheap, setting you back $280 for the 16 GB model. Since both these flagships are a steal, you can decide based on design, camera and size, since performance and battery life are equally good on both flagships. Happy shopping smartphone enthusiasts!